I was on my way to Naveen Jain’s office when I realized that I only had a vague idea of where his office was. Usually, when meeting with ‘big’ executives, a secretary or assistant would schedule the time and send me detailed directions; but Naveen and I had exchanged e-mails directly to coordinate the interview. 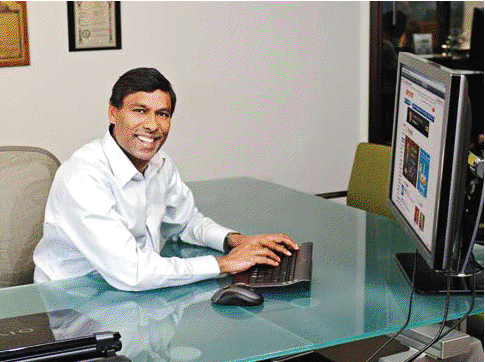 Naveen Jain is the CEO of Intelius, the new 800-pound gorilla in the U.S. identity and background check space. I tried to find a corporate number for Intelius, but the toll-free number led to a sales line with a 20-min- ute wait for an operator. Desperate, I sent him an e-mail via my iPhone from the car, asking for exact directions. The reply was prompt and personal. As I would later find, he gets along well without any secretaries or receptionists. Naveen has always been controversial and feisty, never one to hold back an opinion. In 1996, he had left Microsoft, where we briefly crossed paths, to start Infospace. By 2000, his 4-year old company sported a peak valuation of nearly $30 billion. Then, in 2002, he left Infospace to start Intelius in a space already crowded with thousands of small companies. By 2008, Intelius had over a $100-million revenue-run rate with a nearly 25 percent profit margin. It was named one of the fastest growing companies in America. How does he do it? My goal was to pick Naveen’s brain about entrepreneurship. True to form, when I reached the Intelius office, there was no receptionist. Someone noticed me from a conference room behind the reception desk and called Naveen. It was a lesson on frugality. Later, Naveen would tell me, “Spend every [company] dollar as if it is your own.” We tend to let the idea of being aCEO or an ‘executive’ get to our heads. Having a personal secretary can become an ego massager, rather than a business need. Even before I started the interview, then, I had learnt something about Naveen’s approach to successful entrepreneurship: pure business, pure bottom lines and no frills. SS: What makes a successful entrepreneur? 1. Focus. Most startups die from indigestion, rather than starvation. Do a few things and focus on them. 2. Execution. Don’t get discouraged that 10 companies are already doing it. When we started Intelius, there were 10,000 companies doing public records. What I need to do is out- execute everyone; I don’t need to be the first to market. If I am the first to market, I wouldn’t know whether the market exists or not. Let’s say you build a mousetrap and you start marketing them in Seattle, where there are 10 people selling mousetraps. Then you go to Portland and there is no one selling mouse-traps there. You are happy, because you are first to market [in Portland]. But the reason no one is selling mousetraps in Portland is because there are no mice there! As an entrepreneur, it is very expensive to create a market, to change the behavior of people in a particular region. Your job, as an entrepreneur, should be to figure out what the pain points are and what your solutions to them are, rather than saying, “Here is my great technology. What can I do with it?” Find a problem that already exists. 3. Enjoy what you are doing. I have execution, and I have the focus. The next thing is to really enjoy what you are doing. You must have a passion to win. The idea itself may change, but the passion to win allows you to be both flexible and persistent. SS: Is there a secret code to figuring out when to be flexible and when to be persistent? Listen to your gut; be honest with yourself. You can fool everybody—your investor, your employees, your partner— but in your gut, you will know when it isn’t In a relationship, your heart tells you when it isn’t working. But your brain tells you: she’s from the same caste, we have the same family friends, she is rich—everything is right. It should work, but it isn’t. Your brain has a tremendous veto power over your heart. That’s how it is in entrepreneurship, too. So, trust your gut. SS: What’s the secret to execution? NJ: The secret is to constantly learn and analyze the information you are getting. In the beginning, you have a certain set of information—the hypothesis or data. As you start to move down the path, you are constantly collecting new sets of information, constantly testing your hypothesis. People are so focused on writing their business plans. To me, that is a fundamental problem, when you start telling everyone that this is your path without even knowing what lies ahead. SS: You have to adapt, don’t you? NJ: Constantly. You have to have a great vision—like you want to transform the real estate market. But when it comes to execution, you need a very narrow vision. Have a plan for the next six to twelve months, and don’t think about anything else. Execution becomes good when you slice a great vision into very narrow things; then start executing these small slices. If you start executing on your vision directly, you will never make it. SS: this is true for life too, isn’t it? NJ: Absolutely. Whatever you are doing in entrepreneurship really applies to your per- sonal life as well. But as an entrepreneur, your brain is designed to see opportunities where others don’t. That is a problem, because you are always seeing opportunity wherever you go. It causes you to lose focus. If you see an opportunity, you need to shoot down something that you are doing before you move on and execute the next one. That, by the way, we follow that to the word. There are times when people come to me and say, “We see a big market here.” I say, “Look, we have products that are mature, products that are growing, and products that are being nurtured. If you want me to nurture something new, we need to shoot down something that we have been nurturing. And we do shoot it down. SS: that’s where the issue of flexibility vs. persistence comes in. NJ: Exactly. When you listen to your heart and it says you have tried everything and it still isn’t working, it’s totally cool to move on. Another thing that’s really important is to find people you trust. You spend so much time with these people that you have to enjoy your time with them and trust them. If you are constantly watching your back, you cannot be moving forward. Trust goes beyond saying that I trust them to not steal my or the company’s money. Trust has to do with trusting them to do their job, without having to monitor them. For example, it took me a long while to realize that I don’t need to be in any meetings. If our management team needs me, they will ask me to join them. Right now, there is a meeting going on where they are looking to acquire a company. The CEO of the [other] company is here. I didn’t even talk to them; I know that they will ask me for my help if they need it. The fact don’t ask me does not hurt my feelings. I trust that they will make the right decisions—and if they make the wrong decisions, it would be no different than me making the wrong decisions. Another thing that I tell my managers is that they and their direct reports should never be in the same meeting. If you need to be there, let your direct report leave. If he is in the meeting, trust him to deliver; stay out of the meeting unless he asks for your help. That’s what I mean by trust: trust them to do their job, to ask for your help when they need it, to make decisions on their own. SS: are there any institutional practices that should be ingrained in people who are starting and building new ventures. 1. Think that every company penny you spend is your own money. 3. Know your weakness and find people whose skills will complement yours. 4. Manage the growth. There’s always the temptation to tell the world that you now have 50 employees. Never have that ambition. When I have seven people, I am happy with seven people—I don’t need an eighth person. When I need the eighth person, I will bring him in. 5. Keep the management structure as flat as possible. Don’t create hierarchy and titles. As far as possible, let the structure come into place when people demand it. VCs often make you create the structure—they ask who your VP of Engineering is or who your CEO is. If you are the CEO as well the CTO, so be it. © Sankrant Sanu 2009-2010. All rights reserved. I had failed as an entrepreneur in a very big way. This article pin points exactly where i went wrong, it also mentions the skill needed to be a successful. Which, ironically i also do possess in the same measure. I hope to imbibe the wonderful insights mentioned in your article and hope to restart again. Great interview, love the comment on not having to watch your back. About thIs: You will need more people in business and marketing than you will in technology. When and how do you get those people? How do you work with them? How do you manage them? Is affiliate marketing one way to handle this? Wow… Excellent read… Thought-provoking… It captures the heart of successful entrepreneurship… Thanks a ton for providing this interview.